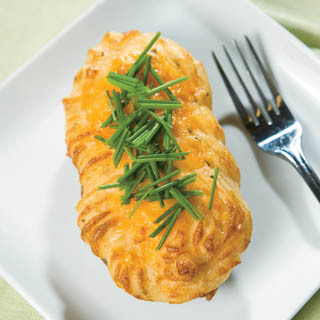 This take on the baked potato combines sour cream, cheese, scallions and butter into the mix, so these twice-baked potatoes are ready and loaded when they come out of the oven. Adjust over rack to upper middle position, and heat oven to 400 degrees. Bake potatoes on foil-lined baking sheet until skin is crisp and deep brown and fork easily pierces flesh, about 1 hour. Transfer potatoes to wire rack and let sit until cool enough to handle, about 10 minutes. Cut each potato in half lengthwise. Using a small dinner spoon, scoop flesh from each half into medium bowl, leaving a ¼-inch thickness of flesh in each skin. Sprinkle with salt and pepper. Meanwhile, mash potato flesh with fork until smooth. Stir in remaining ingredients, including salt and pepper to taste, until well-combined. Spoon mixture into skins, mounding slightly at the center, and return to oven. Broil until spotty brown and crisp on top, 10-15 minutes. Allow to cool for 10 minutes. Serve warm. Hungry for more spuds? Dig into 10 of our favorite potato recipes.